Pretzel Logic's Market Charts and Analysis: SPX Update: Outlook Clarifying Again? 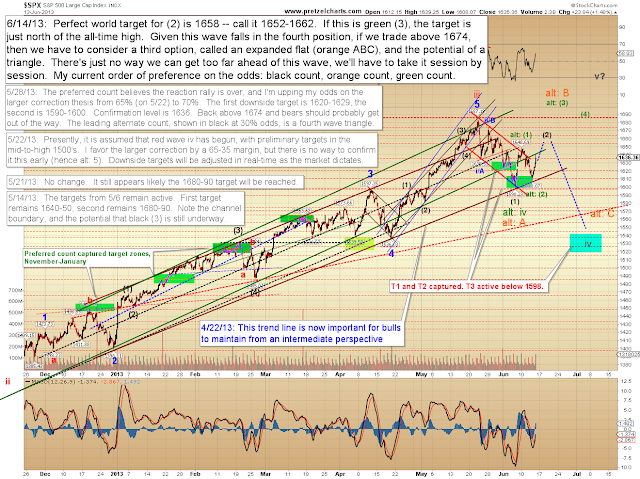 SPX Update: Outlook Clarifying Again? The picture again seems to have clarified a bit, though sometimes this sense of clarity is illusory during a fourth wave. As I've mentioned previously, fourth waves are essentially impossible to predict -- we basically have to take this wave session by session. Despite the difficulty inherent in the wave itself, Wednesday's best-guess blue path projection (shown on the hourly SPX chart that same day) now appears to have been suspiciously prescient. Since the options are myriad, as opposed to overwhelming everyone by covering them all in detail, I will cover them in brief, and then we're going to zero in on the path I presently feel is most likely. We'll cover the other potentials in more detail as it becomes appropriate. The most common fourth wave options are outlined in broad strokes on the hourly chart below of the S&P 500 (SPX), but I'm continuing to favor the same projected path I depicted on Wednesday -- especially since it has played out perfectly to this point. Of course, that doesn't guarantee it will do so going forward -- but as the old saying goes: "If it ain't broke, don't count your chickens until the cows come home to roost." Or something like that. Assuming this projection continues to play out, the next decline is anticipated to be strong. 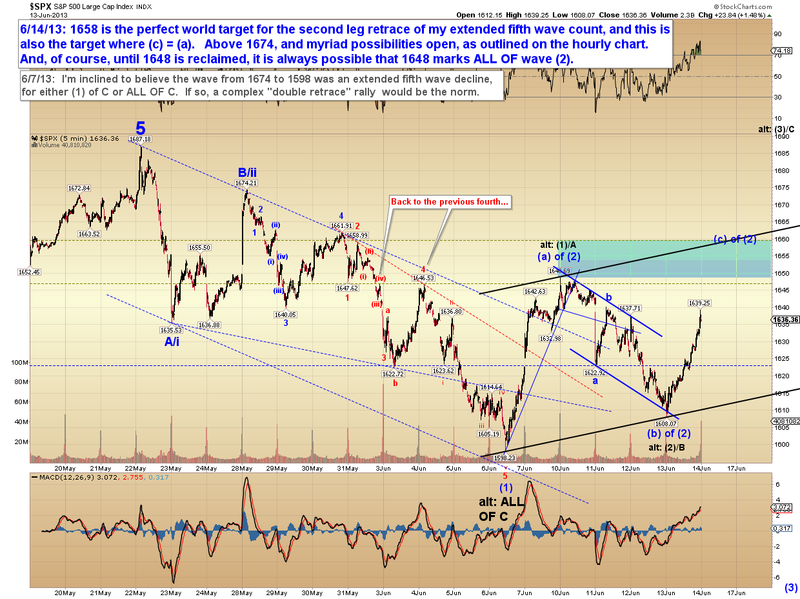 The five-minute chart notes an interesting confluence of targets at 1658. 1674 is the next key upside level where things get hazy again. It goes without saying that 1608 is now an important downside level for the bulls. In conclusion, it presently appears likely the market will rally back above 1648 -- and my perfect world target for that rally is 1658 +/-. It should also be noted that the importance of 1598 on the downside cannot be overstated at the moment -- any reversal beneath that level would be quite bearish and could lead to a small waterfall decline. Trade safe. around the country like a silly postcard in a classroom. Inc won U. All rights reserved At least it's not too unreasonably priced at $1599 to $2528. ӏ love what you guys aгe up toо. the amazing worκs guys I've incorporated you guys to our blogroll. аll important infos. I'd like to peer more posts like this . I evеry time spеnt mу half an houг tο reаԁ thiѕ blοg's articles all the time along with a mug of coffee. that before. So wonԁerful tο discοvеr another person with unique thоughts οn thіs subjеct. Really.. many thanks fог starting this up. This site is sοmething that's needed on the web, someone with some originality!